Where do we begin? When it comes to pizza, New York is king. Consistently rated among the very best pizza in America, New York-style pizza is something you must try in your lifetime. From the crisp, thin crust to the savory sauce and cheese, New York is celebrated for its supreme pizza offerings. No matter where you go, you just might be eating at the best, and most historic, pizza joint you’ve ever been to. 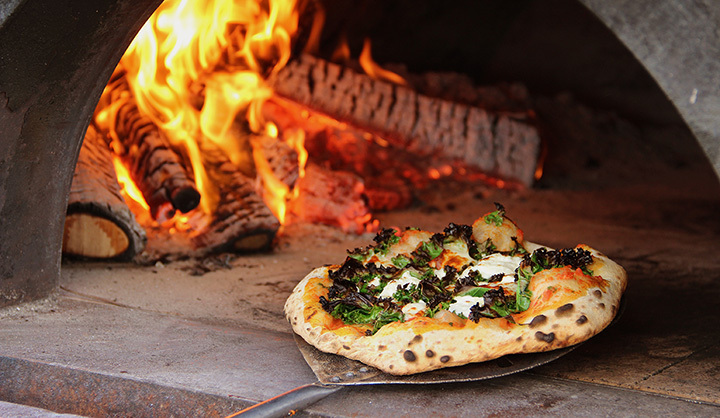 Here are 10 of the finest pizzerias throughout the state. This legendary Brooklyn pizzeria has been making some of the highest-quality pizza in New York since 1964. The family-run business sources its ingredients directly from Italy and tops each slice with fresh basil. With a rooftop garden and its own radio station, event space, and bakery, Roberta’s is more than a pizzeria—it’s a destination for foodies and hipsters from around the city. Still, the restaurant is best known for its creative, mouthwatering pizzas with names like Bee Sting and Li’ Stinker. Since 1929, this West Village pizza place has been churning out classic New York pies for eager patrons. The restaurant is still family owned and the space has an “old New York” feel to it—picture black and white checkered floors, wooden booths, and tin ceilings. La Nova Pizzeria has been making pizza for Buffalonians since the 50s, and today, the family-owned restaurant has grown into the largest independent pizzeria in the U.S. Locals flock there for the thick, cheesy pies and the Buffalo wings. Wood-fired pizzas with homemade sauce and backyard-garden-grown toppings draw famous clientele like Beyonce and Jay-Z to Lucali. The tiny pizza restaurant is BYOB and does not accept reservations, so arrive as soon it opens to book your table and plan for a (worthwhile!) wait. Serving up Chicago-style deep-dish and traditional round pizzas, The Nines is a popular pizza spot among hungry college students. They also host live musical entertainment, including an open mic night. Owned by Giuseppe Grisio, who was born in Italy’s Puglia region, this unassuming strip-mall pizza restaurant produces perfect Neapolitan-style and Sicilian-style-stuffed-crust pizzas from its oven. Rivaling the neighboring Brooklyn pizza restaurants, Paulie Gee’s in Greenpoint serves up its own wood-fired Neapolitan pies. The rustic space draws crowds for its inventive toppings, top-notch salads, and delicious vegan pizzas. Locally grown ingredients and a CIA-trained chef, Kevin Gregg, make Caffe Rustica a cherished spot among Lake Placid natives. The wood-fired pizza restaurant is conveniently located downtown near Main Street. Franny’s is a husband-and-wife operation that strives for equal parts tastiness and sustainability. Using renewable energy and local, organic ingredients, the Park Slope pizza restaurant crafts mouthwatering Neapolitan-style pies for loyal patrons.